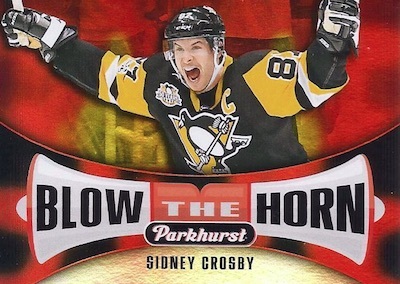 The classic card brand returns for another NHL run in 2017-18 Upper Deck Parkhurst Hockey! 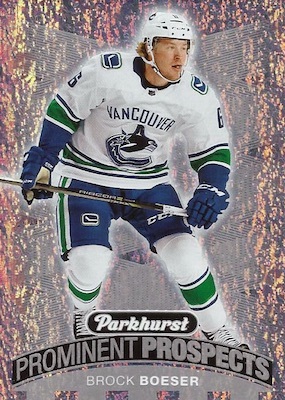 Exclusive to Canadian Walmarts, 2017-18 Parkhurst Hockey is fairly similar to the 2016-17 release, except the main '17-18 set is a bit smaller. Coming in at 300 cards this time, collectors have a moderate selection featuring several players per team and 47 total rookies. There are also three checklist cards. Parallels include Red Border and Black Border for the full set. 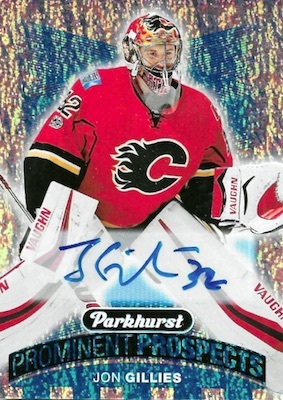 The 2017-18 Upper Deck Parkhurst Hockey checklist also offers several inserts to chase. Blow the Horn opts for emotion with 10 of the biggest current names in the league. On the other hand, East vs. West takes a conference approach, highlighting eight players from each side. 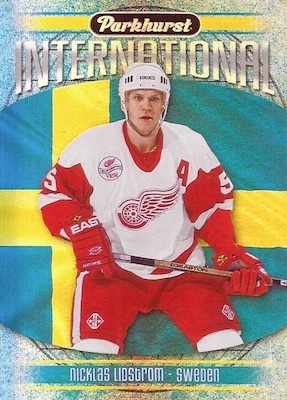 Celebrating the global element found in the NHL, Parkhurst International works with 24 subjects. 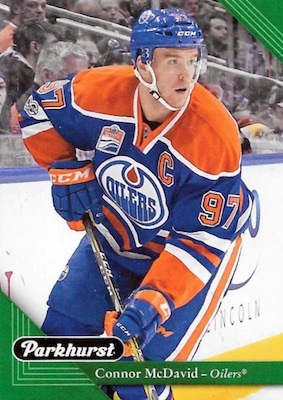 Specific to the rookie class, the 25-card Prominent Prospects insert is only for the newest stars. The set also has several parallels, including Green (#/399 - Blaster only), Red (#/199 - Gravity only), and Gold (#/99 - Blaster only). The limited Blue Autograph version applies signatures for 19 names in the line. 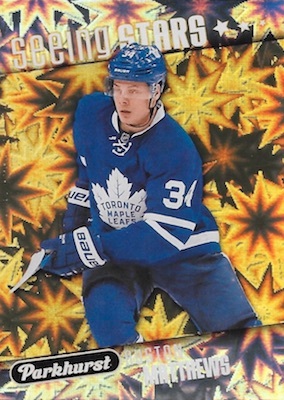 Finally, Seeing Stars is an insert only found in Fat Packs. 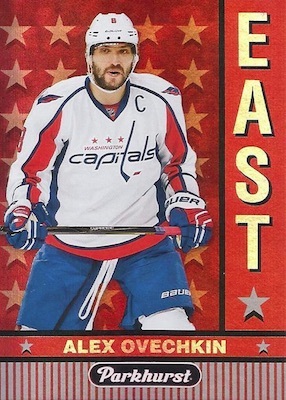 In addition to the base inserts are Red and Blue parallels. Odds Key: g = Gravity, b = Blaster, f = Fat Pack. PARALLEL CARDS: Red Border (1:3 b/g, 3:1 f), Black Border (1:12 b/g, 1:1 f). Odds: 1:10 Blaster/Gravity, 1:5 Fat. Odds: 1:12.5 Blaster/Gravity, 1:6.25 Fat. Odds: 1:4 blaster/gravity, 1:2 fat. Odds: 1:12 Blaster, 1:46 Gravity. PARALLEL CARDS: Green #/399 (Blaster), Red #/199 (Gravity), Gold #/99 (Blaster). Odds: 1:480 Blaster, 1:430 Gravity. Specific group odds listed blow. PARALLEL CARDS: Red (1:3.33 f), Blue (1:10 f). Unannounced. Let us know if you can fill in any gaps. Shop on eBay. What exactly are gravity packs? Thanks Trey. Gravity feed boxes are those large displays that you see in stores that have a little slot and the packs are just piled up inside. They usually hold a good amount of packs, like 36/48 (or more). No holiday spirit?! Loved the Tis The Season subset last year. 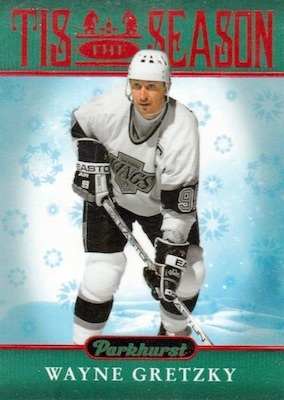 Why did Upper Deck decide to Grinch it? nice set. colours are good. For the price, this is a very nice set to build with nice looking cards. The design is way better than last year for the inserts. Unfortunately, no auto of Patrick and Hischier, but it’s a decent rookie class this year. Fun, affordable and good value cards can be pulled so it’s a 4 stars product for me. I bought 2 blasters and 1 Fat pack of this the other day and i was quite impressed with the overall look and feel of the cards. The photography is above average. One problem that I noticed was that 70-90% of the cards had semi-rough edges. Out of my 2 blasters I pulled a Nikita Scherbak Prominent Prospects Auto! Very exciting for me as a Habs fan. In my Fat pack I pulled a Debrincat red parallel and I also pulled a Debrincat Prominent prospects. Very impressed with the cards that I received with only 7 doubles coming from the 2 boxes. Good photography, good design, nice glossy finish and a thicker card stock. Good way for budget card collectors to get the rookie cards of their favorite players without having to take out a loan. 5 stars all along. The only problem seems to be the edges and corners. For special exclusives products such as Tim Hortons, Parkhurst and Canadian Tire, the quality control seems to have some issues. Besides that, a nice checklist, with many rookies. The subsets are nice, although I must confess I’m not a huge fan of the Blow the Horn and East vs. West subsets. But, all in all, a very nice collection, with good looking cards for a low price. Great set that is not too hard on the wallet. Great for kids! Just found some in a Mass. Walmart. 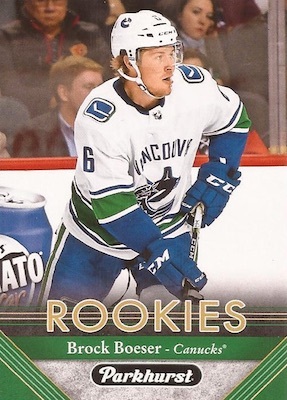 Great rookie selection and nice inserts. Very cool set. “Blow The Horn” ? What the hell is that ? I think more creative subset and insert titles need to be considered.